A group of five men crouch behind a berm. Periodically they stand and fire and then duck again behind sandbags. Their outfit is about a dozen in all. A commander surveys the scene, studying the plumes of smoke in the distance. Later, a helicopter flies overhead, its guns making the sound of a buzzsaw. After the fighting, the Iraqi forces inspect the enemy dead, prodding and kicking the bodies of militant fighters. These are said to be recent images of the battle for Ramadi — the capital of Iraq's western Anbar Province — captured in new video obtained exclusively by MSNBC. Recorded by an anti-ISIS tribal fighter in Ramadi, the video, taken just one week ago, offers a glimpse into what is, by all accounts, a critical moment in Iraq's battle against ISIS. Ramadi fell to ISIS in May, embarrassing the Iraqi government and spurring criticism from the Pentagon that Iraqis lacked the will to fight. ISIS stormed the city, taking over the government headquarters and sending locals fleeing and spurring reports of massacres. The United Nations estimates that more than 180,000 people were displaced since ISIS began its push for Ramadi in April. Six months later, Iraqi commanders are preparing an assault on the center of the city. With American war planes overhead, Iraqi security forces and tribal fighters have closed in on the city, and last week they took a large neighborhood to the city's southwest. On Sunday, Iraqi military planes dropped leaflets asking residents to leave within 72 hours, an indication that an assault is being planned for the immediate next days. The video was filmed last Tuesday, after ISIS launched a counterattack on Iraqi forces massed on the city's eastern side. Iraqi army officials said ISIS unleashed five car bombs, five suicide bombers and 35 fighters as it sought to take a nearby hilltop. 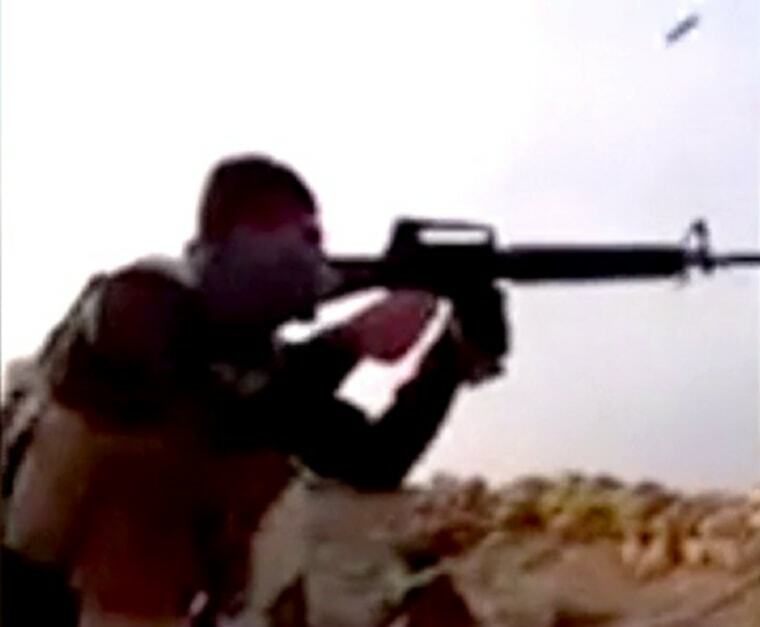 In the video, soldiers from the Iraqi army's 8th Division, along with police forces and local tribal fighters, take aim at the oncoming ISIS fighters, who are not seen on tape. The anti-ISIS tribal fighter, who recorded the video and whom MSNBC is not naming because of security concerns, said the fighting occurred along the army's supply route. The fighter said that the helicopter belongs to the Iraqi army and that it arrived on scene to help repel the ISIS advance. The fighter said he counted at least seven dead ISIS fighters. MSNBC could not independently verify the fighter's claim. The video, 7½ minutes long, consists of a series of clips showing Iraqi security forces fighting along the roadside. Nighttime images, edited to music by the tribal fighter, show the forces inspecting the ISIS dead. In some cases, the men kicked and rested their boots on top of the dead ISIS fighter's heads and chests. The tribal fighter told MSNBC that the men kicked the corpses out of anger for casualties the Iraqi forces have suffered during its two-year fight against ISIS. The battle for Ramadi comes at a delicate time. Seeking to demonstrate that Iraq can handle its war against ISIS, Prime Minister Haider al-Abadi last week refused offers of expanded U.S. military aid, including Apache attack helicopters and additional American military advisers. In the wake of the November attacks in Paris and the attacks earlier this month in San Bernardino, California, President Barack Obama has striven to intensify the battle against ISIS. Speaking to reporters at the Pentagon on Dec. 14, Obama announced that Defense Secretary Ashton Carter would leave for the Middle East to strengthen the coalition fighting ISIS and encourage partners to contribute more militarily. But the effort appeared, in some respects, to run aground in Baghdad. Carter told reporters in Iraq's capital last week that both Iraqi and American military officials said American helicopters and additional American troops were not necessary for operations in Ramadi. "They certainly might be taken up for a future engagement," Carter said. However, American military officials have said an assault on Ramadi will be tough and slow. During a recent news briefing, Colo. Steve Warren, a military spokesman in Baghdad, said ISIS had booby-trapped and mined the city and had stockpiled weapons. "It's a slow process. It's a deliberate process. And urban fighting is tough: It's hot, it's scary, and it can be deadly," Warren said. Warren said that the Pentagon has estimated there are 500 to 1,000 ISIS fighters inside Ramadi but that airstrikes had killed about 350 of them. There are several thousand Iraqi forces encircling the city, Warren said. Military analysts say the advantage in numbers does not guarantee the Iraqis success. "The Iraqi military isn't just taking the fight to the Islamic State. The Islamic State is counterattacking," said Bill Roggio, editor of the Long War Journal and a fellow at the Foundation for the Defense of Democracies. "How much is the Iraqi army willing to fight for it?" Roggio said of Ramadi. "And what type of casualties is the Islamic State willing to take in trying to defend it?" Citing the Iraqi security forces' recent advances, Iraqi officials are sounding confident tones. "I think we are on the verge of breaking the back of Daesh," al-Abadi said last week, using the Arabic acronym for ISIS. A local official in Anbar has declared Ramadi would be taken by Christmas. In a significant recent win, Iraqi forces took the large Tameem neighborhood to Ramadi's southwest on Dec. 8. A second video, obtained by MSNBC from the same tribal fighter, captures Iraqi security forces sweeping through the neighborhood that day. After entering a school building in the district once controlled by ISIS, the security forces climb the stairs to the top of the building. "Raise the flag on the roof," a commander tells a soldier. "Make it fast." The soldier crawls carefully along the rooftop, and then another soldier joins him. Staying low and out of the way of sniper fire, the men unfurl the Iraqi flag. James Novogrod is an NBC News producer. Previously, he worked as a political reporter and embedded with the Michele Bachmann presidential campaign. After Bachmann dropped out of the race, he covered state primaries, the "veepstakes," the Republican and Democratic National Conventions, and the presidential election. Additionally, he spent May through mid-July 2012 in the Orlando area covering the Trayvon Martin story.